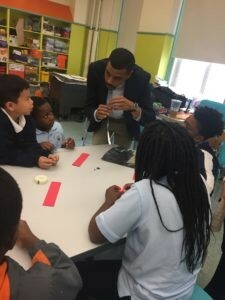 ReadBoston partnered with Reading Is Fundamental and Macy’s to celebrate the power and excitement of reading by holding a Book for Ownership event for the third-grade students at the Holmes Innovation School on September 21, 2018. The elementary school in Boston serves a student body of 82.4% high needs students, including 22.5% students who do not speak English as their first language. At the book celebration event, a staff member read “The Boy Who Harnessed the Wind” to a group of students as a literacy extension activity. Participating third graders were inspired by this incredible true story about a young boy in Malawi who overcomes crippling adversity to save his village from widespread hunger and drought through his ingenuity. This book resonated with the students because they could see their lives reflected in the story of Malawi and were inspired by his perseverance. As part of the Books for Ownership program, each student chose 3 books to take home and own. Many students selected books based on real life events and do-it-yourself style reads and even asked for more books “that show you how to make stuff”. The event concluded with the students participating in a STEM based project where they made LED bookmarks. The most rewarding part of the day was when one of the students was struggling to create an electrical circuit when her LED bookmark finally lit up. The look on her face was a true reflection of her focus in successfully finishing the project. All participating students were also given a RIF family letter to take home to integrate parents into their child’s learning and continue reading outside of school. 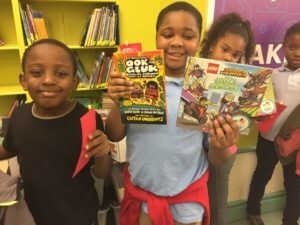 RIF’s Books for Ownership program relies on a simple yet fundamental truth: if you allow children choice and access, they will be more engaged readers. Over 40 million children nationwide have had the opportunity to experience the power and excitement of the Books for Ownership program, and RIF is thrilled to partner with Macy’s inspire more young readers to learn and grow. You can continue reading outside of the classroom with a digital book collection focused on social-emotional learning to help your child tackle daily challenges created through the generosity of Macy’s. Check out a family learning guide from The Day the Crayons Came Home, a read aloud video from The Dot and much more by exploring the Be Your Best You book collection.